On the Drawing Board #13: Maximum Level? 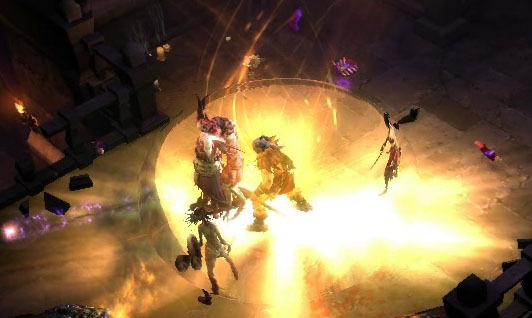 Leveling up in Diablo III comes with a shiny explosion of graphics (which actually deals huge damage to nearby enemies) along with the traditional increases to your stats and skills. That’s all well and good, but how often should it occur, and how many times in total? The D3 Team has said that 100 will likely be the maximum level, but that’s only a tiny part of the question. How long will it take to get there? Days? Weeks? Months? Longer? When will the big diminishing returns kick in as the leveling curve starts to rise? Should there even be a maximum level, or would it be more fun to allow perpetual experience increase, even if level up rewards cease? These and other issues are tackled in this installment of On the Drawing Board. Click through to read the whole article. On the Drawing Board #13: Maximum Level in D3? Let’s start off with a little history, to define our terms. The maximum level in D1 was 50, and reaching it was a tremendous slog. There were no diminishing returns, just tight caps on experience gain, and steadily-increasing numbers of kills required to level up. The journey to 50 wasn’t much fun either, since it meant playing the same few levels over and over again, with very little chance of finding improved items; this was long before the days of exceptional or elite items, and there weren’t even any runes or gems or other trinkets to collect for upgrading purposes. What will it be in D3? Like most game features, the D3 Team hasn’t confirmed anything, yet. Jay Wilson said, and Bashiok repeated, that they’re considering upping it to 100, since 99 seemed like a fairly arbitrary number in D2. However that’s far from carved in stone. Who knows; they may yet go the WoW expansion route and cap Diablo 3 at oh.. 75; then up it 10 or 15 in each expansion. The specific number is almost beside the point, when looking at the larger issue. Whether the maximum level is 50 or 100, the game would be about the same difficulty for characters of a proportionate level. Blizzard would just balance the skill points, skill power, monster difficult, etc, so a level 50 character would be approximately as powerful as a level 100 char, or an 80 was equivalent to a 40, etc. The question I’m more interested in is how attainable the maximum level will be. Should there even be a maximum level? There’s some good discussion of that topic in this forum thread, from which I shamelessly cribbed the concept for this article. What’s a High Level Character? This is probably a bigger issue than the maximum level, since most players will never reach that. What’s a “high level” character? How long should it take to reach? The Diablo series has been fairly unusual in RPGs, in that new characters can level up very quickly. Diablo and Diablo II Players are virtually guaranteed to level up a new character more on their first play session than any session after that. Experienced D2 players think nothing of raising a new character to 60 or 70 in one day, even if they’re unlikely to ever climb past 80~. This is kind of an odd way to design a game, if you think about it. That it works is a testament to the depth and enjoyment of the item-finding game. A character’s level is only a small part of their overall identity and power—their equipment, whether found, crafted, or traded for, is much more important. If you doubt it, imagine a level 65 with great equipment taking on a level 95 with average gear; it’s a slaughter for the little guy, both in PvP or competing at PvM speed/efficiency. 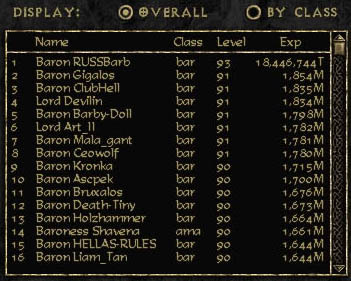 This despite the fact that the level 95 character has logged many times more hours to reach that level. Would you like the leveling curve to remain similar in D3? Should characters be able to zoom up into the 60s or 70s before leveling becomes much slower? Or would you rather the game force a slower advance, making characters work to gain levels as soon as they enter say, Nightmare? Also, when should the game get really hard? As soon as Hell difficulty begins? Or not until later acts in Hell? Should the highest difficulty areas of the game be accessible to all? Or should only very powerful characters, or players supporting each other in groups, be able to defeat the hardest monsters on the highest difficulty level? The number is irrelevant, other than for style points. It’s what the journey to that number is like. Here are some options. In this model just about anyone can get to 99 (or 75 or 100, or whatever) if they put in the grind time. It should be a little harder than the 38 hours that was Clvl 99 in v1.09, but not impossible. Think World of Warcraft for the leveling speed. Weeks or months for casual players, less for dedicated players, guilds, or cut-rate Chinese leveling services. *cough* Yes, I know, a crazy analogy since as we know, nothing in D3 is influenced by Blizzard’s other RPG. Grindfest. The maximum level is possible, in a theoretical sort of way. A single player could reach it, but only with months of very dedicated play on the same character. Teams would find faster methods, ala GerBarb, but it would still require months of 12 hour a day, high-skill, team effort, Act Boss-exploiting, Diablo-killing days. If you want it to be even harder, pull the slider up an exponent or two, but be aware that you’ll be making the maximum level essentially unattainable for any mortal player. No maximum level. No matter how grindy the advance, there is no finish line. This would have to be balanced; perhaps stats/skills could cap while experience kept increasing. Just letting characters level up forever would be just as bad as if every patch introduced hugely overpowered runewords that could only be created through massive rune duping, and then… oh wait. At any rate, in this capless model there’s no maximum level, or perhaps no maximum experience. Characters can keep building exp forever, but it’s purely for their own enjoyment/perversity/ladder ranking. Imagine the time required to go from 99 to 100 is 1% the time required to go from 100 to 101, etc. Is this a good idea? Does Blizzard have a sort of moral responsibility not to include this sort of feature, since it would make the game too addictive/seductive to some players? Including a maximum level allows for an ultimate goal and a sense of achievement, but also is a sort of self defense mechanism to preserve the sanity of some addictive personality types. There’s a lot to consider and debate about this issue, and if D2 is any indication, this debate will continue as the leveling speed (if not the maximum level) gets tinkered with in every patch and expansion.